I asked the mother what the child’s name was and she answered “Felipe”. I told her one of my best friends was Brazilian and his name was Felipe. She gave me an enormous hug and kiss on the cheek and thanked me and every Rotarian in the world for saving her baby’s life. 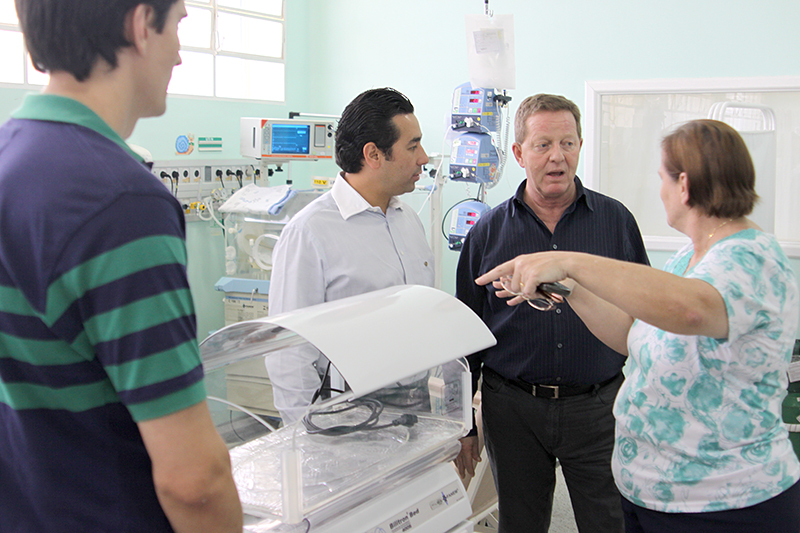 John Wahlund and a premature infant in São Francisco de Assisi Hospital ICU benefiting from Rotary supplied state of the art neonatal equipment. This remarkable and memorable interaction occurred during one of three Future Vision Maternal and Child Health Pilot project evaluations I conducted in São Paulo, Brazil. Rotarians have partnered with the most dedicated and reputable public health care hospitals in this vibrant city of more than 12 million people. 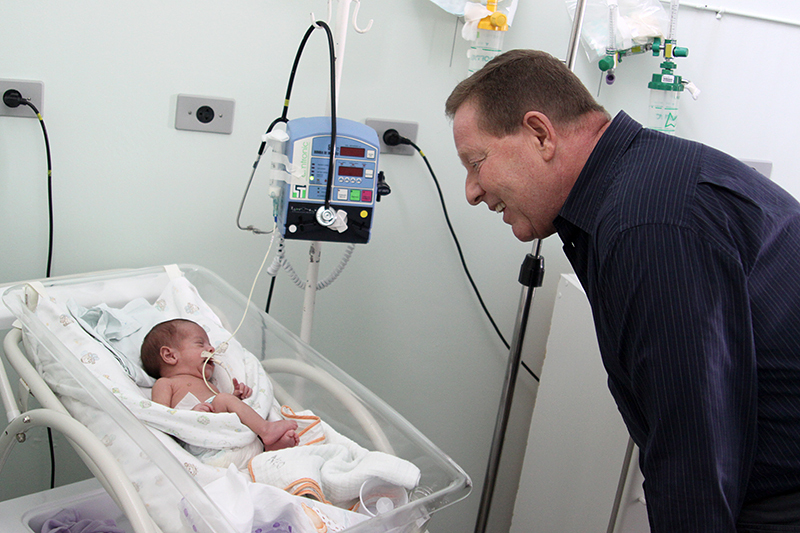 In São Francisco de Assisi Hospital, Rotarians, with the support of a pilot global grant, doubled the incubator and Intensive Care Unit capacity, providing lifesaving services to critically ill newborn babies. Rotarians also strengthened community health services by developing public television health education shows directed towards young adults and pregnant women. All 22 incubators were in use during my visit and there is always a waiting list. The gratitude expressed by attendant moms was overwhelming, as was the sight of these premature infants clinging to life. John Wahlund with Rotarian Remo Batagglia (project accountant) and head administer of São Francisco de Assisi Hospital. In the city center on acres of private wooded land sits the major public health medical center of São Paulo, Santa Casa de Misericordia. Built in the 1500s, it has been maintained and upgraded and today is the preeminent teaching and treatment center dedicated to serving the poor and marginalized. With funds from a global grant and a 3:1 match from other partners, Rotarians established the hospital’s first on-site human milk bank to provide donor milk to critically ill newborns spending months in intensive care. During my visit the Rotarians and their partners ‘christened’ the bank with a mobile van for collecting and distributing milk to three other public health hospitals. The smiles and hugs from the moms lasted all day. 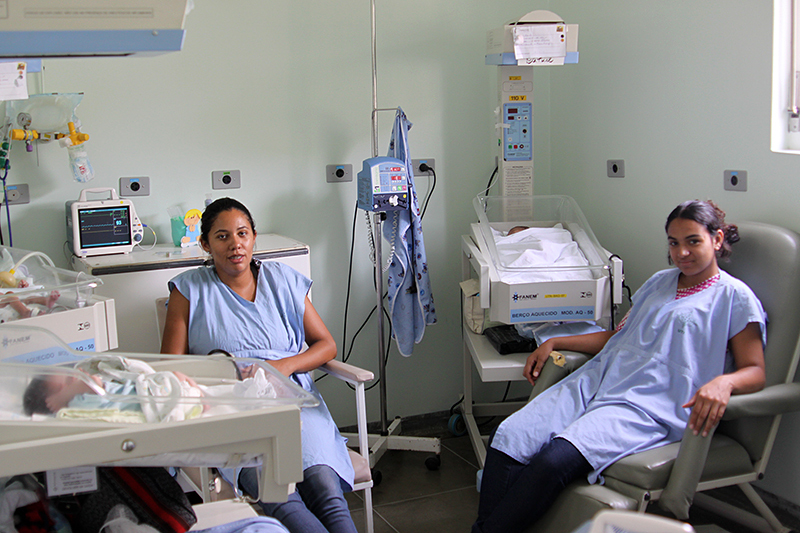 Two mothers in a bonding session with long term hospitalized infants, supported by equipment provided by Rotary clubs. Several hours’ drive north (yet still in São Paulo) sits one of the many growing mini-cities, Osasco. The entire staff of the Hosptial e Maternidade Amador Aguiar turned out for a thankful moment of silence and then a very vocal thank you to the Rotarians who had arranged my visit. This is the only public health maternity hospital available for a population of more than 800,000. We sat in on an amazingly intimate and professional group education and counseling session for young women wanting to learn how to do the right things for their delicate infants and themselves. Also supported by the global grant was a state of the art ‘milk donor’s room’ providing maximum comfort, sanitation and reassurance to the many donors the Rotarians have helped recruit through years of conducting health campaigns. John Wahlund and Rotarian Remo Batagglia with head matron of ICU services at São Francisco de Assisi Hospital. The wonderful staff of the Rotary International Office, Brazil for all arrangements and support. How is your club celebrating Rotary Literacy Month? We had the opportunity to read your report about your (and Rotary’s) efforts on behalf of the new-born children of Brazil. Keep up the good work. You are a genuine humanitarian. You must have a legion of grateful friends for all you do in such a worthy cause. May God bless you and your efforts on behalf of such needy folks.